Coffee grows wild in the highland forests of Ethiopia, Sudan and northern Kenya as an understorey tree. The stimulating effect of the coffee bean has been recognised for almost 2,000 years, and today, coffee is the world’s most widely traded tropical agricultural commodity. Coffee is sought and valued the world over as a brewed beverage. 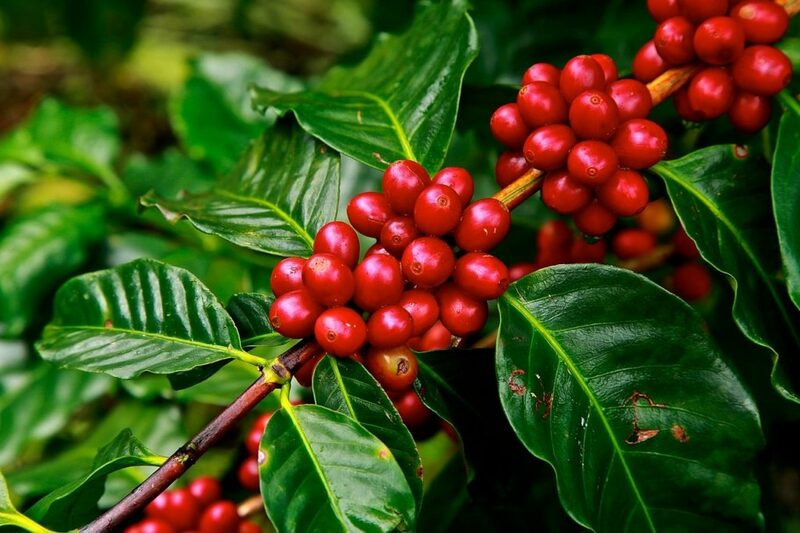 The coffee tree is an evergreen woody perennial that produces green fruit called cherries, which become red when ripe and bear up to two beans (or seeds). The cherries are harvested from the tree and processed to extract the beans, which are dried to produce dry green beans, the tradable commodity of the coffee tree. Dry green beans may be marketed directly to wholesalers; roasted for sale as whole beans or ground coffee for the café and retail markets; or roasted, processed and powdered to produce instant coffee. World wide, coffee drinkers are becoming more discerning about how and where their coffee is produced, as well as spending more time preparing and drinking coffee. Boutique-style and ‘clean and green’ are strong selling points for Australian coffee in domestic and overseas markets. 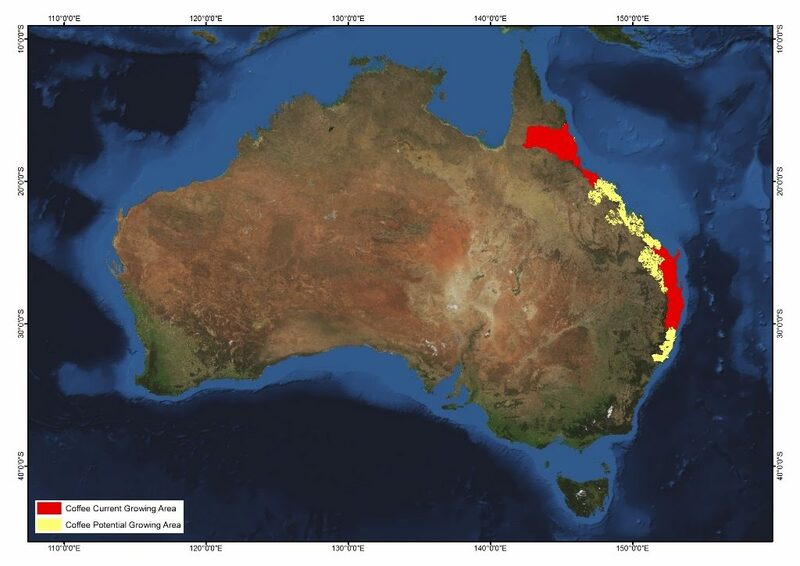 The tropical areas of Queensland and subtropical areas of south east Queensland and north east New South Wales are the most suitable locations for coffee production due to temperature, water availability, well-draining soils and freedom from frost. Coffee plantations in Australia vary in size from a few hectares to 20–40 hectares. Trees are planted at densities of 2,500–4,000 trees per hectare and reach full production in four or five years. A mature plantation will yield about 1-2t/ha of dry green beans. The modern coffee industry of Australia began in the 1980s with the advent of mechanical harvesting. 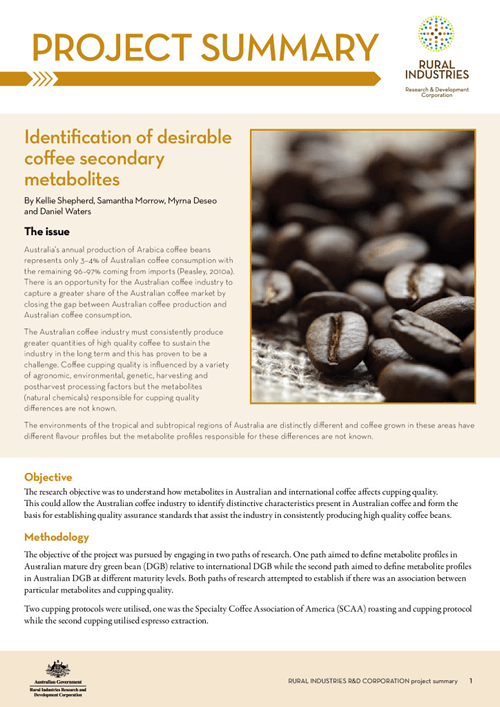 As the Australian coffee industry matures, it is identifying and implementing more efficient farming systems and more sophisticated processing techniques, enabling consistent production of high quality coffee beans. Coffee production in Australia is a developing industry, which began (in its modern form) in the 1980s and 90s. Industry experts estimate there are around 50 commercial coffee growers in Australia, producing coffee on a total of 300–350 hectares. In north Queensland, there are about seven growers producing coffee on 175 hectares; and in north east New South Wales and south east Queensland, there are about 40 growers producing coffee on 150 hectares. Many more landholders may grow very small plots of coffee for their own purpose, which may account for conflicting reports on numbers of coffee growers in Australia. Coffee is grown to produce beans which are used to make a brewed beverage. Coffee is one of the most popular drinks in the world and can be prepared in a number of ways, from brewing ground beans to adding hot water to coffee powder or granules. The caffeine found in coffee has a stimulant effect, and in addition to the taste, accounts for much of the attraction of coffee. Australian coffee producers grow the species C. arabica to produce the high quality Arabica coffee beans required for roasting and selling into premium markets. The C. robusta species, grown in tropical lowland regions overseas, is higher yielding per tree and its beans contain more caffeine. Robusta beans are traditionally used for making instant coffee powder but are in increasing demand in the growing coffee culture as a stand alone brew or blended with Arabica beans. In Australia, coffee is grown in tropical conditions on the Atherton Tableland in far north Queensland and in subtropical conditions in south east Queensland and north east New South Wales. Tree growth, flowering and fruit development varies between the tropical and subtropical regions, resulting in each region producing a distinct flavour profile due to its different climate and soils. Although overseas literature recommends the cultivation of arabica coffee at an altitude of 900–1,200m, the temperatures and rainfall patterns along coastal eastern Australia enable good quality Arabica coffee to be grown at low altitudes, between 15m and 900m. The recommended altitudes of 900-1,200m is to provide for a long, slow ripening period which is also achieved on the southerly latitude of the subtropics in Australia. Within a suitable growing region, there are further considerations for site selection such as topography and water supply. Flat ground is preferred for plantations that will be machine harvested, however hydraulic levelling enables harvest on slopes of up to 20% with side slopes of up to 15%. Ideally the site should be a north-facing slope, so that rows can be set up in a north-south direction. Topography will also influence the design and efficiency of irrigation systems that can operate from a suitable water source (with the necessary irrigation licences or water harvesting rights). Coffee grows best in soils that are naturally fertile, high in organic matter, well drained (to 0.5–1 metre), well aerated and have a profile at least one metre deep. Australian coffee has been grown successfully on red volcanic soils, as well as sandy loam and loamy soils. A well-drained soil is critical because coffee trees do not tolerate waterlogging. Coffee trees prefer a mild climate with mean temperatures between 15-25°C, and small variations in day and night temperatures. Temperatures below 7°C and above 33°C slow growth, reduce production and reduce bean size. Coffee is highly susceptible to frost and even short periods below 0°C will defoliate the bush. Overhead irrigation has been used to protect coffee from frost on small plantations, however on larger farms it is not practical to establish overhead irrigation that runs over the whole farm at one time. The rainfall pattern is an important element of coffee growing regions, especially for mechanically harvested crops. Rainfall after a dry stress period triggers flowering in the coffee tree. The more compact the flowering period, the more even fruit maturity will be at harvest. Tropical north Queensland with its distinct wet and dry seasons is well suited to coffee production from this perspective. Subtropical areas further south experience rainfall throughout more months of the year. However, the relatively dry period of August–September, combined with cool temperatures, provides a sufficient ‘dry stress’ period after which the onset of spring rainfall will trigger flowering. Cooler temperatures during the bean maturity period over winter and early spring allow the bean to remain on the tree in a sound condition for longer periods than in the tropical areas and this extends the harvesting period. There are over 20 species of coffee trees, highly variable in their growing habits, climate requirements and bean characteristics. The typical coffee beverage is likely to come from just two species, C. arabica and C. robusta (also frequently referred to as C. canephora var. Robusta), with C. arabica representing between 60 and 70% of the world’s coffee bean production. 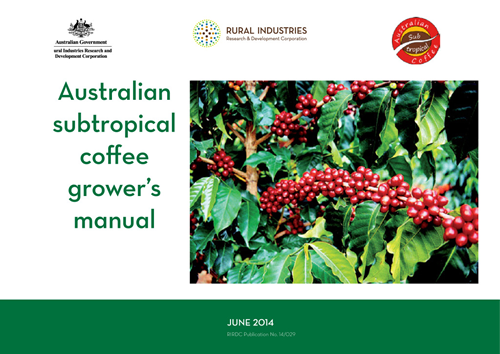 Due to climate requirements, C. arabica is the only species used for commercial coffee production in Australia. In the tropical regions, Catuai Rojo, a red-fruited variety accounts for about 95% of plantings, with the remainder of area planted to Catuai Amarillo (with yellow-fruit) and SL6. In the subtropical regions the predominant variety is K7 and about 5% or less of plantings are CRB and Catuai. Site preparation should include clearing and levelling, to minimise damage to trees and water collection systems by future harvest operations. Tree rows should be ripped and cultivated to break hardpans and improve root penetration. Mounded tree rows (30–40cm) and associated drains, running downhill, have proven effective to control runoff and manage soil erosion on steep slopes. Trees are generally planted to form a hedgerow for ease of machine harvesting, weed control, fertilising, irrigating, spraying and mowing. A ground cover is usually established between the rows to reduce soil erosion. Soil tests should be conducted before planting and corrections made. Coffee prefers a soil pH(water) of 5.5–6.5. If lime or dolomite is needed to reduce acidity, it is most effectively applied and incorporated before planting. Phosphorus is important for root growth, especially in the first 12–18 months after planting. Because it is not particularly mobile in the soil, phosphorus fertilisers, and organic matter if required, should be incorporated into the soil before planting. Coffee trees are very sensitive to wind damage and so establishing windbreaks before field planting is essential. Pinus caribaea and Bana grass (Pennisetum spp.) have been used successfully as windbreaks in far north Queensland while in the subtropics sorghum provides excellent protection during the first two years. Coffee seed generally grows true to type (95%), so seedlings are generally produced from seed rather than cuttings or tissue culture. Coffee can cross pollinate so to avoid the risk of ‘off-types’ seed should be selected from proven trees in blocks of the one variety, or purchased from reliable sources. Some growers will raise seedlings in their own nurseries but if the planting is to be greater than 5,000 trees (or greater than 2–3ha), it is more practical to contract a nursery specialist to raise the required number of seedlings from seed. Planting is usually carried out at the start of the wet season, when trees are 20–30cm tall and 8–12 months old. Trees are planted at densities of 2,500–4,400 plants/ha, depending on the variety. In Australia, planting densities tend to be higher in the tropical areas than the subtropical areas. Coffee trees can grow to six metres but in plantations must be kept to two to three metres to facilitate harvest. Traditionally, coffee in the tropical areas of the world such as Africa and Papua New Guinea was grown under forest trees to provide cooler growing conditions to reduce growth, which in turn reduced management requirements (pruning, water and nutrients) and made it easier for fruit to be handpicked (labour in these regions is not costly and trees are not planted to accommodate mechanical harvesting). In contrast, shade is not required for successful production in Australia and growers embrace the higher yields obtained without shading. The latitudes at which Australian coffee is grown is cooler than the tropical areas so to some extent vigorous growth is managed. The greater demand of the crop for water and nutrients are comfortably managed in the modern, mechanised Australian production environment. In tropical north Queensland, coffee requires 3–7ML/ha/year of water as rainfall and irrigation. Irrigation is essential to ensure good production, especially in areas with sandy soils and rainfall of only 600mm. Northern coffee growers subject their crops to a period of water stress in the dry spring, and then commence irrigation to synchronise the crop for an October–November flowering. 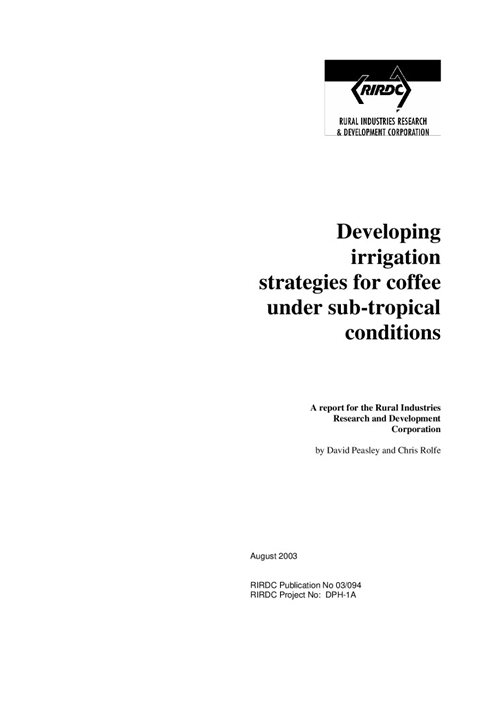 In subtropical conditions, a coffee crop requires 1–4 ML/ha/year of water, as rainfall and/or irrigation. Moisture monitoring is recommended to assist in scheduling irrigation according to plant needs. Yield increases of 25% have been achieved with strategic irrigation, as well as an increase in bean size. A productive crop will require an adequate supply of nutrients each season. To ensure the right nutrients are applied in the right quantities, a fertiliser program should be based on soil and leaf analyses. Fertiliser may be applied by broadcasting product beneath the trees, fertigating through the irrigation system or as a foliar spray. 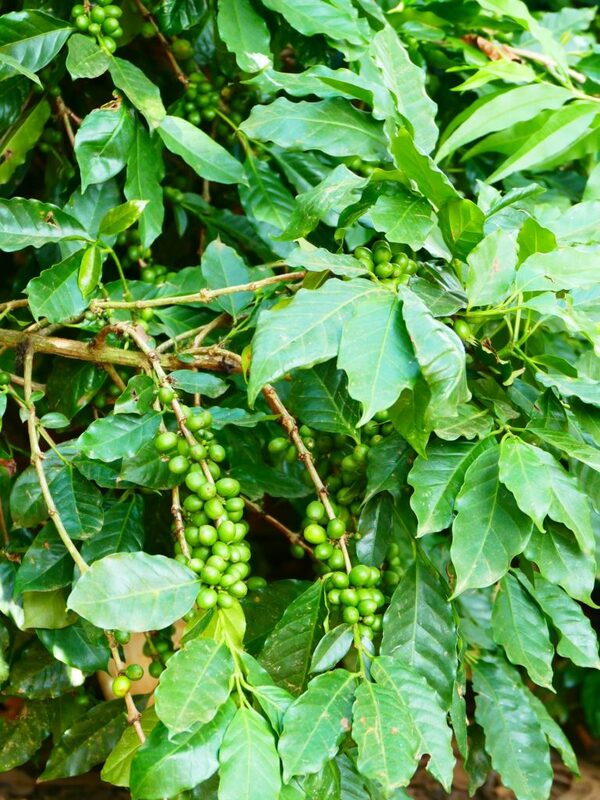 Coffee trees establish quite slowly, so weed control over the first 12–18 months is critical. Before planting, rows should be mulched and weed free; once trees are established, their heavy canopy will shade the ground and reduce or eliminate weed growth. Some problems have been experienced with climbing vine weeds, such as glycine (Glycine clandestina) and sirato (Macrotiliumatropurpuream). 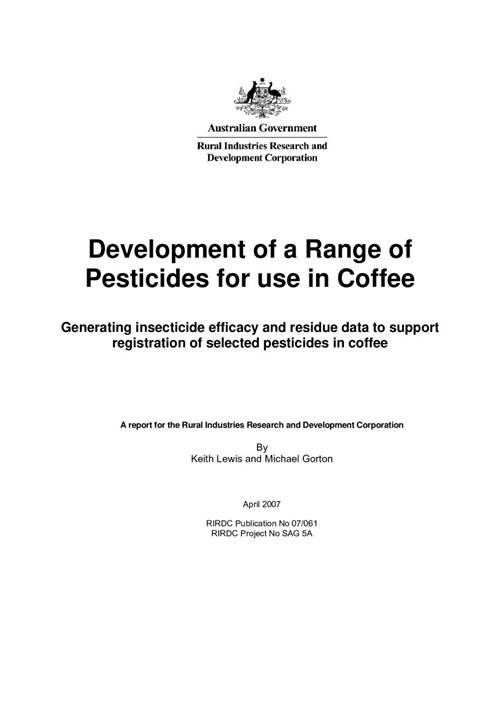 Australia is free of the two most serious and widespread coffee diseases, coffee berry disease and coffee rust. The only significant disease is a fungal disease called cercospora (Cercospora coffeicola), which is most prevalent in warm, wet weather, in nurseries and during early field establishment, usually where nutrient levels are inadequate. Green coffee scale (Coccusviridis) and mealy bug (Planococcusspp.) are the two most common pests that may become widespread in warm, dry environments. In the subtropics, natural predators (parasitic wasps and fungi) and good management (nutrition and irrigation) are usually adequate to control pests, whereas in the tropics, some use of pesticides may be required depending on seasonal infestations. Research is ongoing to understand and register ‘soft’ pesticides that could be used in integrated pest management programs suitable for north Queensland. Machinery requirements for a coffee plantation generally include a tractor, sprayer and fertiliser spreader for in-crop husbandry; a mower for plantation maintenance; and field bins for transporting picked fruit from the plantation to drying and processing facilities. An irrigation system with associated pumps, laterals and sub-laterals will be required to ensure an adequate water supply throughout the year. Irrigation systems may also include an option for fertigation. The decision on whether to purchase a harvester is largely determined by economics. Coffee growers in tropical north Queensland, with plantations of 20–40 hectares, generally have their own harvester. Whereas, coffee plantations in the subtropical region are not large enough to justify the capital outlay of a harvester and will make use of contract harvesting services. Handpicking is considered only practical and viable (especially given labour costs) for plantations of 2,000 trees or less. About five people would be required to pick 2,000 trees in a timely manner and to be cost-effective would rely on volunteer labour or ‘woofers’. Processing and drying facilities may be owned by the coffee grower, or growers may use commercial facilities on a fee for service basis. On-farm processing facilities include a washer/separator, machinery for hulling and pulping, and elevators to move the fruit about the facility. Drying may be done in the sun, with facilities for protection from damp or wet weather; or mechanical driers may be used. Because processing must be undertaken within hours of harvest, it is critical that a grower has the right equipment in place or can make arrangements with reliable contract operators. Because of the high set up cost and expertise required to process the coffee through the various stages to roasting, the industry is moving towards central or group processing facilities to produce a consistent high quality product. Most coffee crops in Australia are harvested mechanically. Growers with large plantations (greater than 20 hectares) generally own a harvester, whereas growers with smaller plantations will engage harvest contractors. Some growers with plantations of one or two hectares may choose to hand pick their crop. For comparison of productivity, a mechanical harvester can harvest at least 10,000 trees per day, whereas one person can pick around 50-80kg of ripe cherry per day or only 10 mature trees per day. In Australia, handpicking generally is not economical for commercial coffee farms. The cherries of the coffee tree ripen and are ready for harvest in June to August in northern Queensland. In northern New South Wales and south east Queensland, where the tree varieties grown are slower maturing than tropical varieties and fruit is slower to ripen, coffee is harvested from August to October. Because coffee trees flower over an extended period, cherries will ripen over an extended period. To maximise the yield of ripe fruit, generally there will be two harvests for a mechanically harvested crop, three to four weeks apart. Hand-picked crops may be harvested up to five times. Modern-day coffee harvesters are able to shake the trees to minimise the amount of green (unripe) fruit that is picked, so that uniformly ripe fruit can be processed and good quality coffee produced. Processing must commence within hours of harvest to remove the fleshy pulp which is high in fermentable sugars. The two methods of processing the picked cherry are dry processing and wet processing. Processing may be carried out on farm with the coffee grower’s own equipment, or the picked fruit is transported to a centralised or group processing facility, where the crop is processed on a fee for service basis. Given the perishable nature of the fruit once picked, it is important that contract processing facilities are located close to the farm and that reliable transport arrangements for the harvested fruit are possible. The simplest processing method is dry processing where over-ripe coffee is harvested and dried to 10–12% moisture and then stored if necessary. Prior to roasting, the dried skin and parchment remaining around the beans is removed by hulling, leaving green bean coffee. Wet processing produces the best quality coffee and most Australian coffee is processed this way. 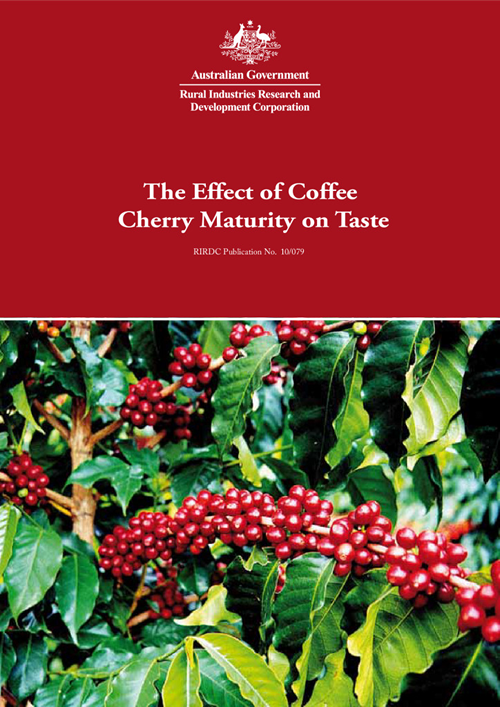 Ideally, the coffee cherry is harvested as ripe red fruit and many new processing systems can separate fruit of different maturities, so a consistent, top quality coffee can be produced. The washed and separated fruit is pulped to remove the beans (seeds) from the skin. The beans are fermented or passed through a demucilager to remove the sticky mucilage layer around them, and then washed and dried to 11% moisture. The beans can be dried on farm by sun drying or mechanical drying, or drying can be carried out by a contractor. Often the same contractor will offer harvesting, processing and drying services. Once dried the coffee beans still have a tough parchment layer which needs to be removed prior to roasting. Parchment coffee (beans with the parchment layer) can be stored for a number of years under suitable environmental conditions of temperature and relative humidity without loss of quality. Prior to roasting, the parchment and silver skin around the bean are removed by hulling and polishing, resulting in green coffee beans. Green bean begins to deteriorate in quality once it is hulled especially if not stored and transported under strict suitable environmental conditions. Coffee is traded internationally as green bean. It generally takes between 6–7kg of fruit to produce one kilogram of green bean coffee. A mature tree will yield 1.5–4kg of fruit, which when processed produces 250–600g of dry green bean. The green bean may be sold to processors for blending and roasting, however many Australian growers roast, package and market their own product. The world coffee market is enormous. Almost eight million tonnes of dry green bean is produced and traded annually, led by Brazil producing 2.7 million tonnes of dry green bean, and followed by Vietnam (961,000 tonnes) and Columbia (637,000 tonnes). Many coffee producing countries are improving the quality of their coffee to target the upper end of the market (boutique or gourmet) where price premiums are significant. Specialty coffees such as single origin, shade grown, ‘Rainforest Alliance’, ‘Fair Trade’ and various accredited organic and ‘natural’ grown coffees are attracting price premiums because of their perceived social and environmental appeal. Australia’s emerging coffee industry has the capacity to target this expanding but highly competitive market at a domestic and export level. There is a significant opportunity for Australian growers to replace imported beans with their own product at the high end of the coffee market. 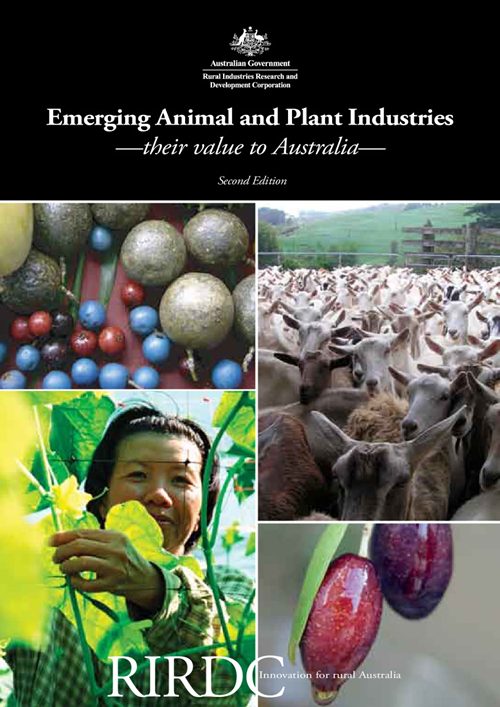 Currently, approximately 50% of Australia’s production is exported. Australian growers also have a comparative advantage as their green bean is fresh compared to imported beans because it is usually hulled immediately prior to roasting. 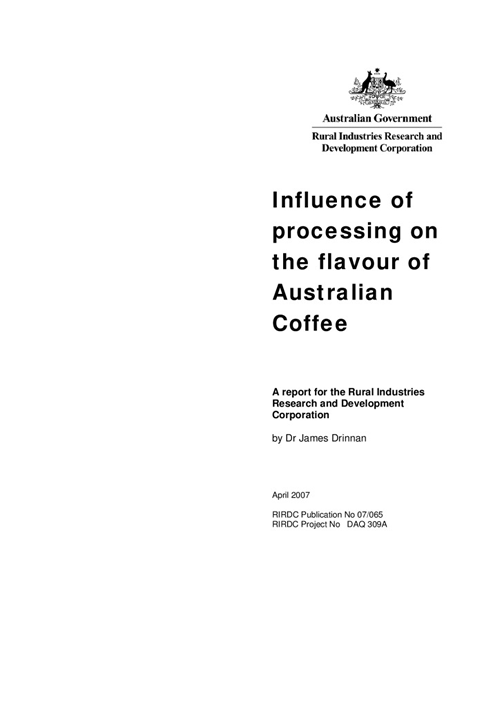 The growth and sophistication of the Australian coffee market, the willingness of consumers to pay well for a quality product, the concern over food miles and the economic attractiveness of home-grown production are all favourable conditions for the continuing development of the Australian coffee industry. As an agricultural industry, coffee’s natural production systems make it compatible with urban and close settled areas and well positioned for regional agricultural tourism. An industry survey of subtropical coffee growers showed that 76% of growers sold some or all of their coffee roasted, and only 12% sold their coffee as dry green bean. The general trend for subtropical producers on smaller farms is to value-add their product, i.e. 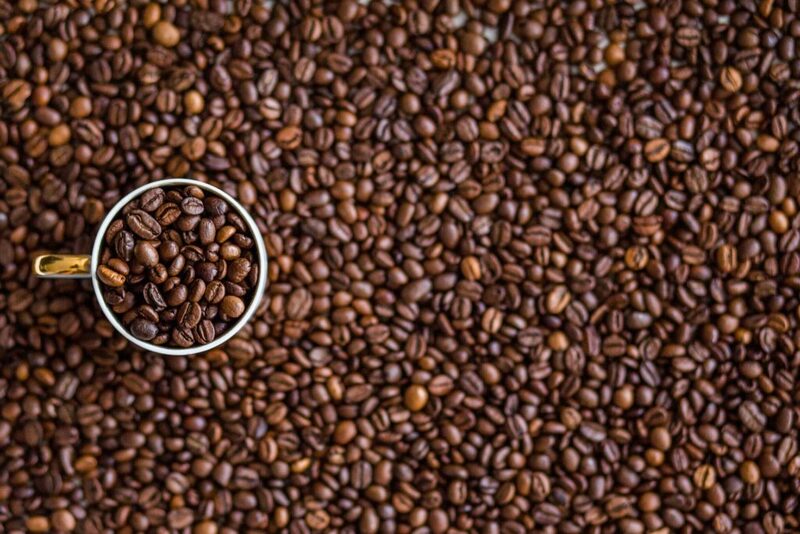 roast, package and blend coffee under an estate name; whereas tropical producers on larger farms on-sell processed coffee to wholesalers who roast and blend coffee beans (beans not only from Australia but also imported beans). New entrants to the industry, in the subtropical areas, face the initial challenge of acquiring land that is suitable for coffee growing at a reasonable price. Ideal coffee growing land is becoming increasingly developed and more densely populated. Once plantations are established, coffee growers face the challenge of predicting income and the subsequent difficulty of planning and budgeting. Income, which is driven by yield, will vary with the age of the trees, climatic conditions (rainfall in particular), fertility of the soil, and agronomic management of the plantation. Product quality also impacts on income and consistency can be difficult to manage. Quality is affected by variations in seasonal conditions, uniformity of maturity stage of the harvested fruit and processing techniques. Further, understanding the relationship between processing and end use is important. Traditional wet processing in the subtropics that removes the mucilage from the seed is well suited for plunger coffee but recent research shows this process does not produce the flavour complexities and body suitable for espresso style coffee. As a result the industry has developed a high quality espresso coffee by using a range of harvesting and processing strategies to increase the complexity of the flavour profile and its appeal to the broader coffee consuming community. As an industry, Australian coffee growers face challenges presented by small production volumes and fragmentation; gaining credibility as a reliable and consistent supplier of quality product is paramount in the highly competitive international market. That said, a few larger Australian producers have successfully initiated export development programs through brokers to Europe, Japan, USA, New Zealand and Hong Kong. Price competitiveness in a world market and against coffee imports into Australia is important and challenging. 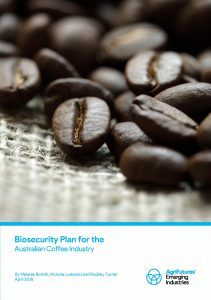 Global competitors have very large plantations and relatively low production costs, and although Australian coffee can be marketed on superior quality characteristics, efficiency in production and processing systems remains critical for Australian producers. There are no local or state government regulations specific to coffee production other than those that apply to agriculture and food production generally. If a coffee growing enterprise is planning to operate its own processing facility, it must treat and dispose of waste water responsibly, so as to not affect neighbours or waterways. The seeds of the coffee tree are easily dispersed by birds and readily germinate in suitable conditions. While coffee plants have been grown in Australia for over 130 years and coffee is not a weed of note, care should be taken to manage any trees establishing outside the plantation area. Coffee plantations require irrigation water to ensure good water supply to plants at all times of the year. As such coffee growers require an irrigation licence or water harvesting rights to take water from water sources. Australian Subtropical Coffee Association – this association represents the coffee industry from Noosa in the north to Coffs Harbour in the south and the Northern Rivers region of far northern New South Wales.